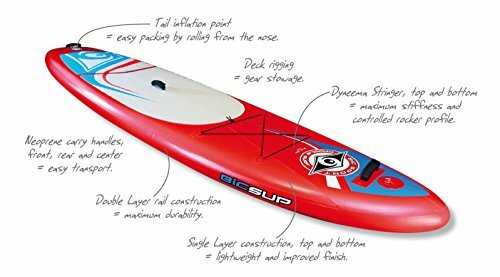 A great choice for anyone looking for a portable, compact, durable and lightweight board, the SUP AIR series features best-in-class performance thanks to 6″ thick drop-stitch construction and a 15psi inflation limit. SUP AIR boards fit neatly into the included backpack, easily fitting in the trunk of a car or boat locker. All SUP AIR boards inflate quickly and easily with the included high-pressure pump and pressure gauge. New for this year, all SUP AIR boards come with premium FCS Fins and feature a 10″ US fin box, a universal fin box that accepts all types of fins. 4 sizes in 2 Shapes available. The 10’0 for paddlers > 175lbs and 10’6 for paddlers >200lbs are great ‘All Around’ performers for flat-water and small wave surfing. The 11’0 for paddlers >220lbs and 12’6″ for paddlers >240lbs have a narrower profile and low aspect nose for top touring performance and glide in flat-water conditions. Repair kit also included in the unlikely event of a puncture or leak. >. 10-Feet 6-Inch x 33-Inch x 22# x 235L, 10-Feet x 30-Inch x 20# x 200L, 10'6", 8'4", 9'2"